Psoas sign is positive when there is an abdominal pain as the patient moves his leg against resistance . The abdominal pain is associated with relfexive or direct irritation of the psoas muscle. Positive psoas sign usually indicates localizes abscess or appendicitis. Psoas sign may be elicited on the right or left sides. Psoas sign is elicited after performing a complete abdominal examination in a patient who complain of abdominal or lower back pain. Appendicitis is suspected if psoas sign is positive while performing an abdominal examination in an acute emergency setting ( acute abdominal pain). The patient vital signs are checked and the patient is prepared for surgery. The patient fluids and food intake are restricted and the analgesic is with hold as it my mask the symptoms. IV fluid is given to rehydrate the patient. Avoid enema or cathartic as it may lead to rupture of appendix which cause peritonitis. Peritonitis or peritoneal irritation is elicited by checking for positive Rovsing's sign. The Rovsing ' sign is positive if palpating deeply on the left lower quadrant cause a pain under the right lower quadrant of the abdomen. The differential diagnosis of positive Psoas sign are appendicitis or retroperitoneal abscess. A positive Psoas sign is associated with inflamed retrocecal appendix ( appendicitis). Appendicitis is initially presented as epigastric and periumbilical pain which later disappear and reappear as a localized and worse pain in the right lower quadrant. The pain will be worsen by coughing and walking. Other findings are rebound tenderness, abdominal rigidity, diarrhea, or constipation, nausea and vomiting. other physical signs are malaise, anorexia, retractive respiration, tachycardia and fever. If the patient suffered from the rupture of the appendix , an additional signs such as board like rigidity and high fever may present. Retroperitoneal abscess is associated with a lower retroperitoneal infection. Lumbar abscess or iliac abscess will develop after lower retroperitoneal infection. The present of this abscess will produce a positive left or right iliac psoas sign if elicited and fever. An iliac abscess may produce a tender mass in the groin on lower abdomen. This mass is palpable. Besides that an iliac abscess may causes inguinal or iliac pain which radiates to the knee, flank, thigh or hip. Lumbar abscess may present as palpable lumbar mass. Patient may complain of back spasm or tenderness on the affected sides. It is important to monitor the patient's vital sign and observe for any signs of complication such as extension of pain along the facial planes in the pleural cavities, mediastinum , subphrenic spaces, hip, thigh, abdomen as well as sign of peritonitis. The position of the patient can be changed to promote comfortability of the patient. The patient may be asked to lie down an d flex the right leg. Electrolytes, abdominal x ray and other diagnostic test are considered in patient with positive psoas sign. Psoas sign can be elicited in child by asking the child to raise the head while the pressure is exerted on the child's forehead. Appendicitis is suspected if the child complained of right lower quadrant pain. The peritoneal signs and psoas signs are decreased in elderly people or absent at all. It is also important to differentiate , degenerative joint pain and musculoskeletal pain by performing psoas maneuvers. There are 2 technique to elicit a psoas sign. Each technique indicated positive psoas signs if abdominal pain is elicited due to irritation of the psoas muscle from a localized abscess or inflamed appendix. The first technique requires the patient to lie supine. The patient is instructed to move his flexed left leg against the hand of the examiner to test for left psoas sign. The maneuver is the repeated on the right leg. The second technique requires the patient to lie on his right side ( to test for the left psoas sign) and later on his left side ( to test for the right psoas sign). 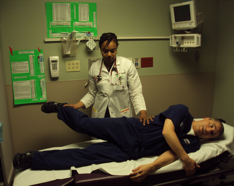 In both cases,the patient is asked to push his leg upward from the hip against the hand of the examiner.